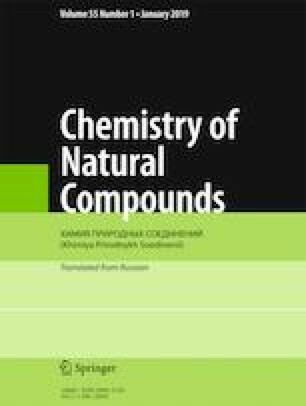 Phytochemical investigation of the roots of Taraxacum coreanum (Asteraceae) led to the isolation of two new sesquiterpenes, acetyldihydrotaraxinolide (2) and acetyltaraxinolide (4), together with two known sesquiterpene glycosides, 11β,13-dihydrotaraxinic acid (1) and taraxinic acid β-(6-O-acetyl)-glucopyranosyl ester (3). The structures of the isolated compounds were determined on the basis of spectroscopic analysis. Published in Khimiya Prirodnykh Soedinenii, No. 2, March–April, 2019, pp. 240–242. This work was supported by the Basic Science Research Program (2015R1D1A1A09058498) through the National Research Foundation of Korea.